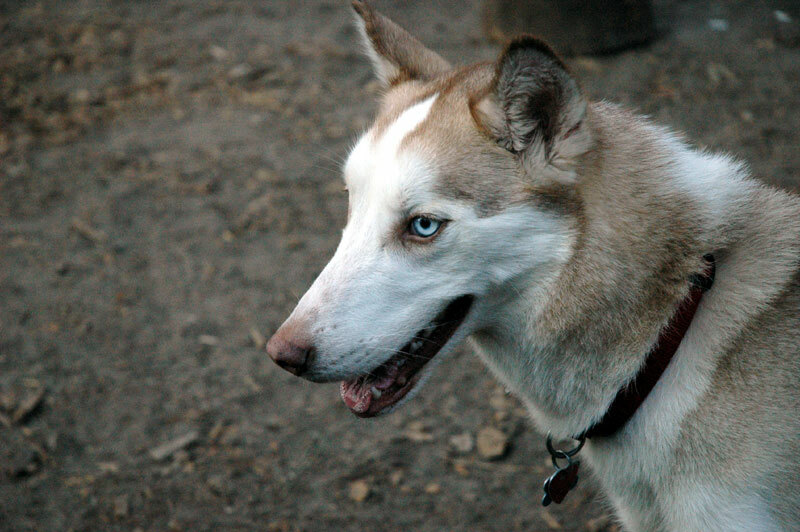 My Siberian husky, Isis, joined the pack in 2004 at the age of one. It took her a little while to realize that my house was now her house—she set out to chew all that could be chewed, presumably as part of some sort of imperative of destruction. Eventually, she came to realize that she was chewing her stuff—or so I like to say. More likely, joining me on 8-16 mile runs wore the chew out of her. As the years went by, we both slowed down. Eventually, she could no longer run with me (despite my slower pace) and we went on slower adventures (one does not walk a husky; one goes adventuring with a husky). Despite her advanced age, she remained active—at least until recently. After an adventure, she seemed slow and sore. She cried once in pain, but then seemed to recover. Then she got worse, requiring a trip to the emergency veterinarian (pets seem to know the regular vet hours and seem to prefer their woes to take place on weekends). The good news was that the x-rays showed no serious damage—just indication of wear and tear of age. She also had some unusual test results, perhaps indicating cancer. Because of her age, the main concern was with her mobility and pain—as long as she could get about and be happy, then that was what mattered. She was prescribed an assortment of medications and a follow up appointment was scheduled with the regular vet. By then, she had gotten worse in some ways—her right foot was “knuckling” over, making walking difficult. This is often a sign of nerve issues. She was prescribed steroids and had to go through a washout period before starting the new medicine. As might be imagined, neither of us got much sleep during this time. While all stories eventually end, her story is still ongoing—the steroids seemed to have done the trick. She can go on slow adventures and enjoys basking in the sun—watching the birds and squirrels, willing the squirrels to fall from the tree and into her mouth. While philosophy is often derided as useless, it was actually very helpful to me during this time and I decided to write about this usefulness as both a defense of philosophy and, perhaps, as something useful for others who face similar circumstances with an aging canine. Isis’ emergency visit was focused on pain management and one drug she was prescribed was Carprofen (more infamously known by the name Rimadyl). Carprofen is an NSAID that is supposed to be safer for canines than those designed for humans (like aspirin) and is commonly used to manage arthritis in elderly dogs. Being a curious and cautious sort, I researched all the medications (having access to professional journals and a Ph.D. is handy here). As is often the case with medications, I ran across numerous forums which included people’s sad and often angry stories about how Carprofen killed their pets. The typical story involved what one would expect: a dog was prescribed Carprofen and then died or was found to have cancer shortly thereafter. I found such stories worrisome and was concerned—I did not want my dog to be killed by her medicine. But, I also knew that without medication, she would be in terrible pain and unable to move. I wanted to make the right choice for her and knew this would require making a rational decision. My regular vet decided to go with the steroid option, one that also has the potential for side effects—complete with the usual horror stories on the web. Once again, it was a matter of choosing between the risks of medication and the consequences of doing without. In addition to my research into the medication, I also investigated various other options for treating arthritis and pain in older dogs. She was already on glucosamine (which might be beneficial, but seems to have no serious side effects), but the web poured forth an abundance of options ranging from acupuncture to herbal remedies. I even ran across the claim that copper bracelets could help pain in dogs. While some of the alternatives had been subject to actual scientific investigation, the majority of the discussions involved a mix of miracle and horror stories. One person might write glowingly about how an herbal product brought his dog back from death’s door while another might claim that after he gave his dog the product, the dog died because of it. Sorting through all these claims, anecdotes and studies turned out to be a fair amount of work. Fortunately, I had numerous philosophical tools that helped a great deal with such cases, specifically of the sort where it is claimed that “I gave my dog X, then he got better/died and X was the cause.” Knowing about two common fallacies is very useful in these cases. This fallacy is committed when it is concluded that one event causes another simply because the proposed cause occurred before the proposed effect. More formally, the fallacy involves concluding that A causes or caused B because A occurs before B and there is not sufficient evidence to actually warrant such a claim. While cause does precede effect (at least in the normal flow of time), proper causal reasoning, as will be discussed in an upcoming essay, involves sorting out whether A occurring before B is just a matter of coincidence or not. In the case of medication involving an old dog, it could entirely be a matter of coincidence that the dog died or was diagnosed with cancer after the medicine was administered. That is, the dog might have died anyway or might have already had cancer. Without a proper investigation, simply assuming that the medication was the cause would be an error. The same holds true for beneficial effects. For example, a dog might go lame after a walk and then recover after being given an herbal supplement for several days. While it would be tempting to attribute the recovery to the herbs, they might have had no effect at all. After all, lameness often goes away on its own or some other factor might have been the cause. This is not to say that such stories should be rejected out of hand—it is to say that they should be approached with due consideration that the reasoning involved is post hoc. In concrete terms, if you are afraid to give your dog medicine she was prescribed because you heard of cases in which a dog had the medicine and then died, you should investigate more (such as talking to your vet) about whether there really is a risk of death. As another example, if someone praises an herbal supplement because her dog perked up after taking it, then you should see if there is evidence for this claim beyond the post hoc situation. Fortunately, there has been considerable research into medications and treatments that provide a basis for making a rational choice. When considering such data, it is important not to be lured into rejecting data by the seductive power of the Fallacy of Anecdotal Evidence. Anecdote A is told about a member (or small number of members) of Population P.
Conclusion C is drawn about Population P based on Anecdote A. For example, a person might hear anecdotes about dogs that died after taking a prescribed medication and infer that the medicine is likely to kill dogs. Reasonable statistical evidence S exists for general claim C.
Anecdote A is presented that is an exception to or goes against general claim C.
Conclusion: General claim C is rejected. For example, the statistical evidence shows that the claim that glucosamine-chondroitin can treat arthritis is, at best, very weakly supported. But, a person might tell a story about how their aging husky “was like a new dog” after she starting getting a daily dose of the supplement. To accept this as proof that the data is wrong would be to fall for this fallacy. That said, I do give my dog glucosamine-chondroitin because it is cheap, has no serious side effects and might have some benefit. I am fully aware of the data and do not reject it—I am gambling that it might do my husky some good. The way to avoid becoming a victim of anecdotal evidence is to seek reliable, objective statistical data about the matter in question (a vet should be a good source). This can, I hasten to say, can be quite a challenge when it comes to treatments for pets. In many cases, there are no adequate studies or trials that provide statistical data and all the information available is in the form of anecdotes. One option is, of course, to investigate the anecdotes and try to do your own statistics. So, if the majority of anecdotes indicate something harmful (or something beneficial) then this would be weak evidence for the claim. In any case, it is wise to approach anecdotes with due care—a story is not proof. The murder of nine people in the Emanuel AME Church in South Carolina ignited an intense discussion of race and violence. While there has been near-universal condemnation of the murders, some people take effort to argue that these killings are part of a broader problem of racism in America. This claim is supported by reference to the well-known history of systematic violence against blacks in America as well as consideration of data from today. Interestingly, some people respond to this approach by asserting that more blacks are killed by blacks than by whites. Some even seem obligated to add the extra fact that more whites are killed by blacks than blacks are killed by whites. While these points are often just “thrown out there” without being forged into part of a coherent argument, presumably the intent of such claims is to somehow disprove or at least diminish the significance of claims regarding violence against blacks by whites. To be fair, there might be other reasons for bringing up such claims—perhaps the person is engaged in an effort to broaden the discussion to all violence out of a genuine concern for the well-being of all people. In cases in which the claims about the number of blacks killed by blacks are brought forth in response to incidents such as the church shooting, this tactic appears to be a specific form of a red herring. This fallacy in which an irrelevant topic is presented in order to divert attention from the original issue. The basic idea is to “win” an argument by leading attention away from the argument and to another topic. The topic of racist violence against blacks is being discussed, specifically the church shooting. The topic of blacks killing other blacks is brought up. The topic of racist violence against blacks is abandoned in favor of focusing on blacks killing other blacks. This sort of “reasoning” is fallacious because merely changing the topic of discussion hardly counts as an argument against a claim. In the specific case at hand, switching the topic to black on black violence does nothing to address the topic of racist violence against blacks. While the red herring label would certainly suffice for these cases, it is certainly appealing to craft a more specific sort of fallacy for cases in which something bad is “countered” by bringing up another bad. The obvious name for this fallacy is the “two bads fallacy.” This is a fallacy in which a second bad thing is presented in response to a bad thing with the intent of distracting attention from the first bad thing (or with the intent of diminishing the badness of the first bad thing). Bad thing A is under discussion. Bad thing B is introduced under the guise of being relevant to A (when B is actually not relevant to A in this context). Bad thing A is ignored, or the badness of A is regarded as diminished or refuted. The murder of nine people in the AME church, which is bad, is being discussed. Blacks killing other blacks, which is bad, is brought up. The badness of the murder of the nine people is abandoned, or its badness is regarded as diminished or refuted. Because of this, it is important to distinguish between cases of the fallacy (X is bad, but Y is also bad, so X is not bad) and cases in which a legitimate comparison is being made (X is bad, but Y is worse, so X is less bad than Y, but still bad). I’m not associated with the game, other than their use of my fallacies.